Believes in empowering you to make intelligent decisions about your skin and hair. Does NOT test on animals. 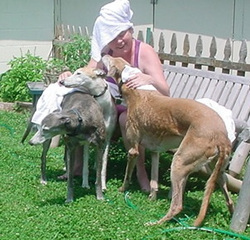 * I should mention however that our rescue greyhounds did stand in line to try out a shampoo one stifling hot summer day. See pic below. In 2011 did donate 10% of our TOTAL SALES (not net profits) to volunteer-run rescues for both people and animals, and we continue to donate to several causes. Imports all henna directly from India so you can be assured of its purity. We use our products ourselves. It's not good enough for YOU if it's not good enough for ME. Uses as pure and natural ingredients as possible because I believe our bodies do best with these sort of ingredients. Hi! My name is Linda Mackey DO and I'm the founder of Southland Soap. I'm an osteopathic physician with a strong holistic slant who got serious about using natural hair color in 2008 after becoming sensitized to chemical hair dyes. I began using henna for color and condition and never looked back. After much work, I discovered how to put enough henna in a shampoo bar to actually get color and Southland Soap was born. In late 2011 the self-mix henna dye was developed and we continue to go on from there. We have customers around the globe and around the neighborhood and treasure you all. Do you have a question? A problem? A compliment? I'd love to hear from you; just fill out the contact form below.